Five SKA SA Research Chairs allocated to South African Universities have been filled by leading international researchers. The SA Research Chairs Initiative (SARChI) of the Department of Science and Technology and the National Research Foundation aims to strengthen science and engineering in SA by attracting and retaining excellence in research and innovation at South African universities. But, the past ten years have seen a surge in the development of new radio telescopes, such as the SKA pathfinders, of which MeerKAT is a prime example. By virtue of their large scale and novel observational regimes, the capabilities of these instruments would be compromised by the old 2GC methods. With the SKA itself around the next corner, it has become increasingly clear that new methods need to be developed. This has fuelled demand for third-generation (3GC) techniques, and has provoked a very rapid development of the field. These circumstances have created a situation in which a small number of specialists are trying to solve an overwhelming amount of interesting new problems. There is much new ground to explore, and not enough scientists to explore it. This provides an extremely fertile environment for young researchers and students, and offers an opportunity for Rhodes – and, more broadly, the South African radio astronomy community in general – to take the lead in the field. The SKA Research Chair in Extragalactic Multi-Wavelength Astronomy is headed by Prof Claude Carignan. He says that after many years of experience using radio synthesis techniques with the Westerbork array in the Netherlands, the Very Large Array in the USA, the Australia Telescope Compact Array in Australia and the Dominion Radio Astronomical Observatory in Canada, the idea is to apply those techniques to study the most abundant gas in the Universe, neutral hydrogen (HI), using first the prototype KAT-7 (2012), thereafter the MeerKAT (2016) and finally the full SKA instrument (2025). Multi-Wavelength astronomy means combining radio observations with data obtained at other wavelengths of the electromagnetic spectrum (UV, optical, infrared, X-rays and gamma-rays). For example, a large program has started making optical spectroscopy observations on the SALT telescope of the MHONGOOSE galaxy sample that will be observed in HI with MeerKAT. All those observations (radio and optical) will be combined to study the mass distribution in galaxies with the aim to answer two fundamental questions in astronomy: how much dark matter is there in galaxies, and how is it distributed. Once those two questions have been answered, we should be able to address the nature of dark matter, which does not emit any detectable radiation, but which we know is present by its gravitational influence on visible matter. “The SKA will be a wonderful instrument for cosmology” says Prof Maartens. It will reach deeper into space and further back in time than optical telescopes and provide the largest ever ‘moving map’ of the Universe. Maartens and the team of researchers working with him are developing the theoretical tools to interpret this moving map and to test our models of the Universe against the wealth of data in the map. This work involves a combination of physics theory, astronomy and statistics, and it relies on computers to deal with complex equations and huge amounts of data. The sheer size of the SKA map of the Universe brings into play new effects from Einstein’s theory of general relativity. These new effects have only recently been discovered by cosmologists, and much work remains to be done to explore them. We need to understand the general relativity effects in order to use the SKA data as a probe of dark energy and other features of the Universe. Different members of the team work on different aspects. The MSc, PhD students and postdoctoral researchers in the team share knowledge and help each other, and they interact with other researchers in the UWC Astrophysics Group (http://uwcastro.org). The UWC group, which was set up by Prof Catherine Cress in 2008 with support from the SA SKA project, includes experts on radio and optical astronomy, and on techniques for analysing observational data. 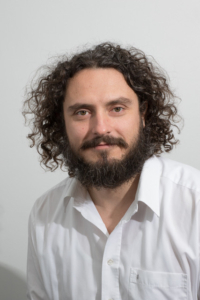 Headed by Prof Dirk de Villiers, the SARChI Chair in Antenna Systems for the SKA is hosted at the Department of Electrical and Electronic Engineering at Stellenbosch University. Prof De Villiers, and his colleagues in the group, have many years’ experience in designing and developing microwave and RF systems for a variety of applications – including radio astronomy. Given the unique challenges presented by radio telescope instruments, standard microwave design principles often fall short when designing for the very tight sensitivity and noise specifications over the bandwidth required by modern systems such as MeerKAT and the SKA. The group at Stellenbosch thus performs research into antenna and related microwave and RF system design specifically for radio telescope applications. This includes the development of advanced optimisation and modelling routines specifically tailored to the features of interest of a radio telescope. They are working on designs of reflector feeds, array antennas and RFI monitoring and mitigation systems for the current version and future extensions of the SKA – as well as some other related instruments. The work is done in collaboration with several leading astronomy instrumentation groups around the world, while skills developed in this group are widely transferrable into other fields of microwave and RF communication. SKA SA research chairs provide the backbone of the SKA SA academic infrastructure.